I recommend that everyone starting out online use Get Response for an e-mail marketing program. Their interface is so easy to use, and it does everything that you need it to do so you can get the job done effectively! I have never had any problems using the service, and their customer support is always extremely helpful! You can even test drive the system for free by signing up for a free account! (On the “pricing” page there is an option at the bottom that says “Sign Up For A Free Account.”) Click that, sign up, and you will be in business! 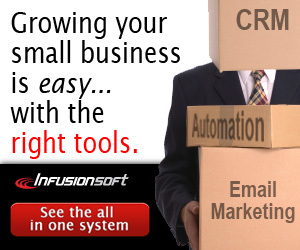 If you are looking for an all in one business building tool that intelligently automates all of your sales, marketing, and follow up, Infusionsoft is the product that I highly recommend that you use. After seeing the power of the software at Infusioncon 2011, I was drooling over how amazing this product is. It has everything that you need to dominate your niche, and the price you pay will be recouped after you start experiencing massive results. Here is the best part, you can click the banner below to sign up for a free demo so you can see it in action. Sign up for the demo, and prepare to be absolutely amazed at how this software will transform how your business will grow forever. If you are looking for one of the easiest popup managers to incorporate into your site that increase sales and e-mail sign ups look no further. AdImpact makes an incredible product that is affordable for all business owners. This tool has been responsible for increasing opt-ins by 300% with previous people I have worked with in the past. You can’t go wrong with this tool! Click the banner below to go to the website and see the product in action! If you are anything like me, the possibilities that you will see with this are endless! Snap Engage is an awesome service that allows you to interact with your visitors and convert more of them into loyal paying customers. You can’t go wrong with this technology to help you increase sales on your website! E-Junkie is an awesome service that allows you to easily sell your products online with a paypal account and a downloadable product. Plans start at $5/month and is incredibly easy and convenient to use!